Designed for 21st century living the Coleridge offers 1,609 sq ft of living space and features an open plan kitchen, breakfast and dining area which is situated at the rear of the property, in addition there is also a garden room which features French doors opening to the rear garden. Off the kitchen is a useful utility room with access to the garage door and rear garden. The kitchen has been thoughtfully designed and features an AEG double oven, extractor, gas hob, fridge freezer and dishwasher. The design of the kitchen allows plenty of storage space and also features an integral breakfast bar area. The remainder of the ground floor includes a hallway with downstairs WC and large separate living room measuring 11’ 1” x 16’ 6”. The Coleridge also features an integrated double garage. The first floor provides four large bedrooms, the generous master bedroom features an ensuite and dressing area. The guest bedroom also features ensuite facilities, the remaining two bedrooms are served by a family bathroom. All the bathrooms are furnished with high quality Roca sanitary ware. Currently, Bellway have a range of two, three, four and five bedroom house styles available at Collingwood Manor which start in price from £199,995. 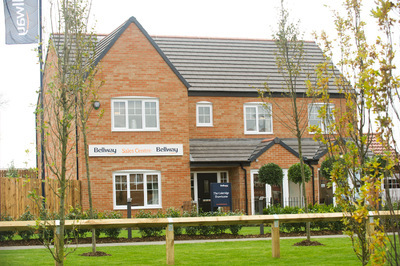 To assist buyers with a move the Collingwood Manor, Bellway can offer buyers their free of charge Express Mover service, where Bellway will appoint an estate agent who is focused upon achieving a quick and satisfactory sale of your old home. Bellway may also consider part exchange arrangements. Buyers can also take advantage of the Government’s Help to Buy scheme. For families, at Collingwood Manor, there are a number of well-regarded schools near the development, including Abbeyfields First School and Morpeth First School for younger children and The King Edward VI School for older students. Northumberland College offers a range of apprenticeships and higher education courses, and is a 15-minute drive away in Ashington, while the University of Northumbria and Newcastle University can be reached in around 20 minutes by car. For commuters, Collingwood Manor enjoys excellent road links, with the A1 easily accessible, linking with Scotland to the north and Newcastle, Durham, Doncaster and onwards to London to the south. Morpeth Railway Station is less than five minutes drive away (20-minute walk) and from there regular services run into Newcastle, Durham, Leeds, London, Edinburgh and Bristol. For domestic and international flights, Newcastle Airport is a 20-minute drive from Collingwood Manor. Our sales office is open 11:00am – 7:00pm Thursday and 11:00am – 5:30pm Friday, Saturday, Sunday and Monday.